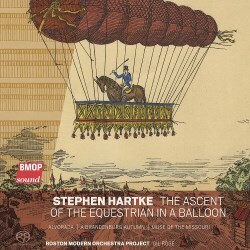 The Ascent of the Equestrian in a Balloon is a compelling title, and as the booklet notes announce it “opens with bracing bravado, suggesting a maverick fanfare.” Stephen Hartke won a Grammy award in 2013 for Best Contemporary Classical Composition, and expectations of excitement and excellence are amply rewarded in this collection. Stravinsky is cited as an influence in Ascent, and there are indeed some connections in the astringent close chord structures used and plangent progressions at the work’s mid-point. This music does however retain an unmistakably American feel in its uplifting rhythmic character, the syncopations towards the end tumbling us towards a rousing conclusion, the high trumpet at times reminding us of the lead in a jazz big band. Alvorada; Three Madrigals for String Orchestra is inevitably gentler due to its instrumentation. ‘Alvorada’ is a Portuguese term music and lyrics on themes of love, in this case referring to a 13th century poem by Nuno Fernandes Torneol. As instrumental Madrigals there is a lyrical and narrative quality to the writing in these pieces, though the melodic shapes are, while highly expressive, not lyrically ‘singable’ in a conventional sense. Hartke retains a strong connection to the stringed-instrument idiom, exploring unison sonorities and elusive modalities to create a strong feeling of atmosphere as well as conjuring sensations of vocal communication. The final Ballada is the most vigorous and in many ways the more conventional of the three in its driving energy. A Brandenburg Autumn is described in Joseph Woodard’s booklet notes as “the strongest example of Hartke’s instinct for addressing his love for deep, centuries-old traditions – but with modern musical garb – by giving a due genuflection at the altar of Bach.” This commission from the Orpheus Chamber Orchestra was for a piece that related to Bach’s First Brandenburg Concerto, though the instrumentation is for a large part the only tangible connection to Bach’s original. A harpsichord adds a certain amount of Baroque crispness, but not in ways Bach would have recognised, and the dance titles such as Sarabande and Rejouissance: Hornpipe take on a life far beyond their musical and semantic origins. The penultimate Sarabande is indeed slow and stately, though once again with some of that Stravinsky-like intensity in evidence, the harpsichord taking us some way towards colours in The Rake’s Progress. This is sandwiched between a quirky Scherzo and that final Hornpipe, a movement with plenty of rhythmic impulse and some virtuoso hocketing amongst the winds. The final piece, Muse of the Missouri takes us firmly into American music, the gentle but distinctive plucking of a banjo that replies to Bach’s harpsichord in the previous work. This is Hartke’s ode to Kansas City, for whose orchestra the piece was written. Reflective, Ives-like atmosphere with sweeping strings builds to a dramatic, granite-strong section which propels us into a gentler but still deeply eloquent centre. A majestic climax is achieved towards the end of the work, possibly reflecting the awesomeness of landscape and the relentless flow of the Missouri river. Recorded and performed with the BMOP’s usual stylishness and thoroughly positive vibes, this is a collection of superb orchestral works that deserves a place in any record collection. Stephen Hartke’s origins are unmistakeable but these pieces go far beyond typical ‘Americana’, projecting a vitality and artistic integrity that makes each piece entirely memorable.